This small application will same you hours of work when thinking up activities for your kids' birthday parties. It creates treasure and scavneger hunts for you in a matter of minutes and such that willl keep the children of all ages occupied for a solid hour or so. 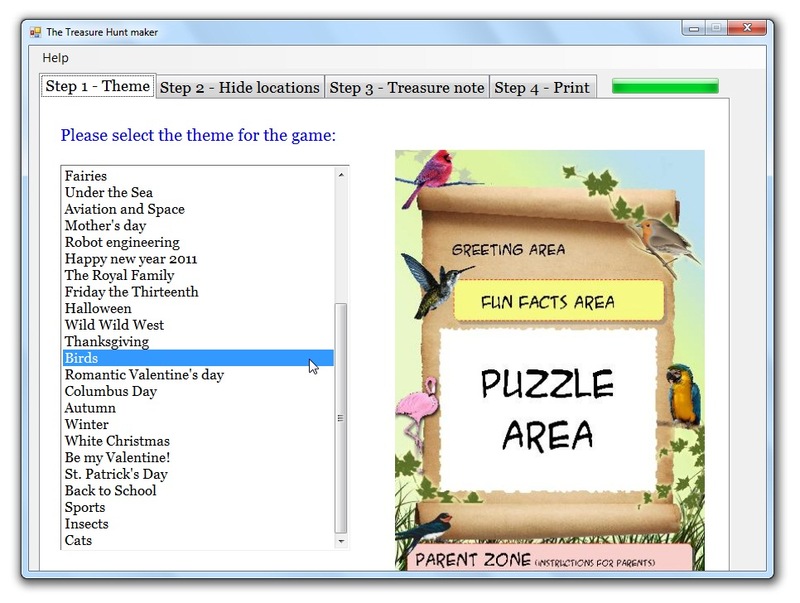 You don't have to think up and clues or riddles, you just open the application and it downloads from our server a vast variety of puzzles, riddles and graphics that will fit any age. ...... They include puzzles you need to cut with scissors and reassembt, puzzles you need to fold in a very special manner and look through a strong light, optical illusions and more.over all, more than 20 different kinds of puzzles ensure that every clue is exciting. this puzzles are fitted to your children's age groups, from 3 year olds and up to adults (hard puzzles)! Plus every page on the printout you create has a beautiful graphical theme in full color for every occasion and many interests. to date, more than 30 different grahpical themes are available and we keep adding more and more. Each page will also include a 'fun fact' about the subject you selected for your graphical theme. So for example, if you are hosting a Dinosaurs themed slumber party, that you will have a scavenger with Dinosaur graphics and Dinosaur fun facts. Qweas is providing links to Treasure Hunt Maker 1.3 as a courtesy, and makes no representations regarding Treasure Hunt Maker or any other applications or any information related thereto. Any questions, complaints or claims regarding this application Treasure Hunt Maker 1.3 must be directed to the appropriate software vendor. You may click the publisher link of Treasure Hunt Maker on the top of this page to get more details about the vendor.